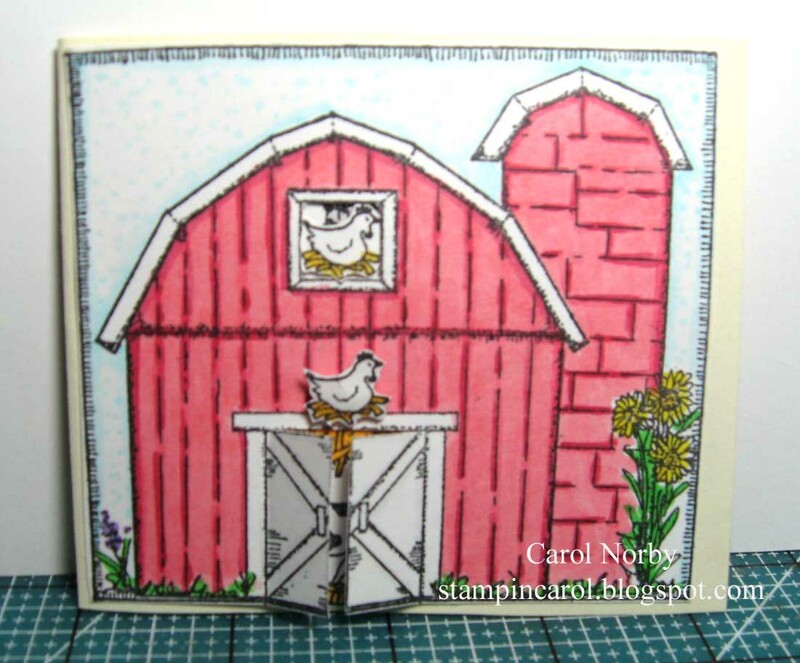 I was searching my shelves for something when I seen my LARGE wood mounted barn stamp set. I haven't used it in a few years so off the shelf it came. Well, after 2 tries and not getting a good image the rascal got ripped off the wood and mounted on cling cushion. Problem solved. Worked great. Want to see my barn? 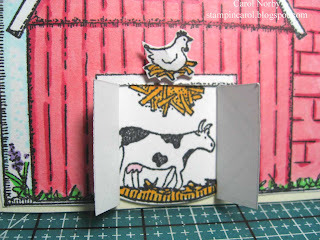 I'm still working on the photo box (hubby keeps forgetting to get me the hack saw) so I took this pic on my Scor-Pal mat. The stamp set is by Limited Edition. And there's something behind the barn door! The cow is part of a circle of animals. You just turn the circle! All images are colored with Copics. The chicken just above the door hides the brad. 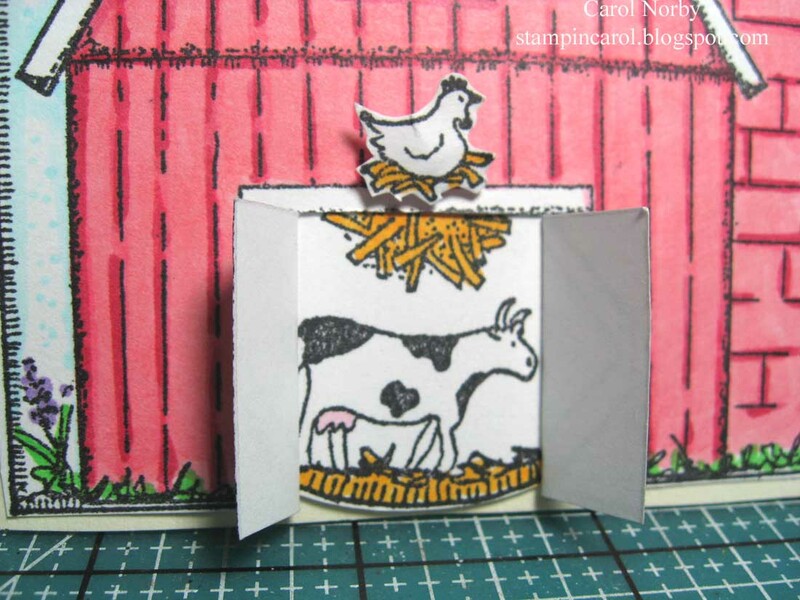 I put another chicken in the window above the door to hide the animals as they show up upside down! The window had marks saying to cut out the center and that would have looked horrible if left there. Or maybe I should have then adhered the chicken over it. I'll have to try it again! I'm a bit slow stamping lately. Between the heat and a cat who wants out starting about 11 pm (I really don't want to let her out, we have coyotes just north of us) I'm not getting much for sleep. Been having to take a nap in the afternoons but that's not really helping much either. Closing the bedroom door doesn't work, she just sits at the door and yowls! I do make her stay out some during the day but she has long hair and the heat really messes with her, too. Any suggestions?? Darling card, Carol. 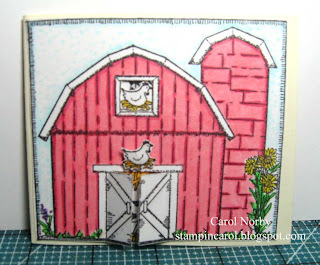 I've been ripping off the last of my wood-mounted stamps, the cling is so much more forgiving.